I love it when game designers include inside jokes or other references in their games. As most of us know, Fantastiqa's designer Alf Seegert has a PhD in literature, and by his own admission he wanted Fantastiqa "to inform and be informed by my academic research." 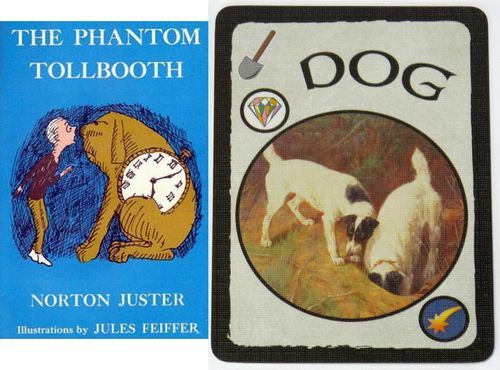 From his article "Why I Design Games", we already know that the most formative book of his childhood was The Phantom Tollbooth, and unsurprisingly its influence is apparent in the game. But there are many other apparent influences and allusions to classic works of the fantastic, including C.S. Lewis, Tolkien, The Wizard of Oz, The Princess Bride, and others. Instead of rodents, Fantastiqa has rabbits! 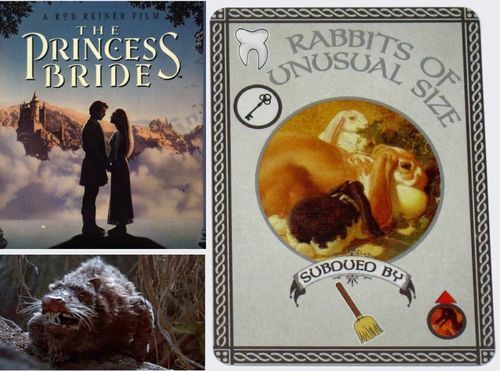 [insert drumroll...] Introducing the Rabbits of Unusual Size! I love it already - deckbuilding games do need more rabbits, after all! I could be wrong about this one, but the idea of having a dog with you as your companion in a fantastic world seems awfully reminiscent of what happened to Milo in The Phantom Tollbooth. Great, great, book by the way! Are there more literary references or allusions in Fantastiqa? There must be more than the ones mentioned here - I just haven't been clever or well-read enough to find them! I suspect there's more, because clearly there's a creative mind at work here! Admittedly, in many cases the influences are more a matter of style, or are somewhat of a spoof on stereotypical creatures that inhabit the usual fantasy genre, and thus can't be pinpointed exactly. For example, creatures like "the Carnivorous Cave-Wight of Wongo", "the Woozle of Ooze" and quests like "swinging from the Marsh Mangroves of Myria and win back the Gem of Joopolo" probably don't have counterparts in existing literature, but do bear their style. Please post here if you find other literary references, allusions, or influences in the game! Maybe even Alf himself will chime in to help us out at some point. He's done some terrific work, and I love the fact that Fantastiqa has been informed by his academic background in literature, and enhanced by his own alliterative and creative literary prowess. Thank you Alf, and consider this thread a tribute to and appreciation of what you have brought to this game! 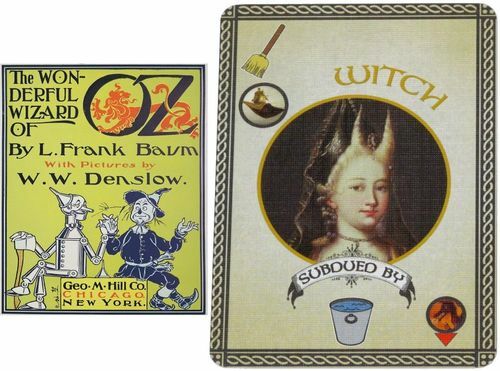 Having water subdue the witch is, of course, from Oz. ....the Witch began to shrink and fall away. "See what you have done!" she screamed. "In a minute I shall melt away." 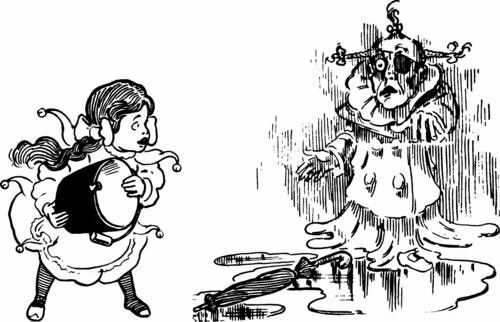 "I am very sorry, indeed," said Dorothy, who was truly frightened to see the Witch actually melting away like brown sugar before her eyes. "Of course not," answered Dorothy; "how should I?" "Of course not," answered Dorothy; "how should I? I never played Fantastiqa back in Kansas." 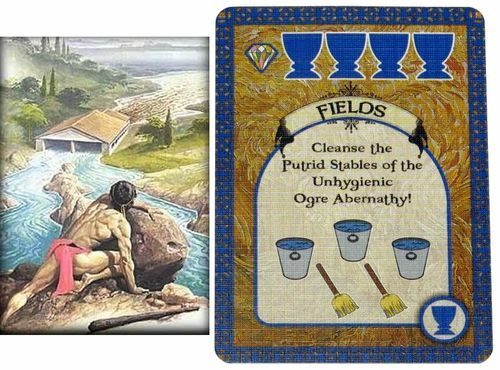 --"Cleanse the Putrid Stables of the Unhygienic Ogre Abernathy" (requires three pails, two brooms) brings to mind the cleaning of King Augeas's stables in the 12 labors of Hercules. 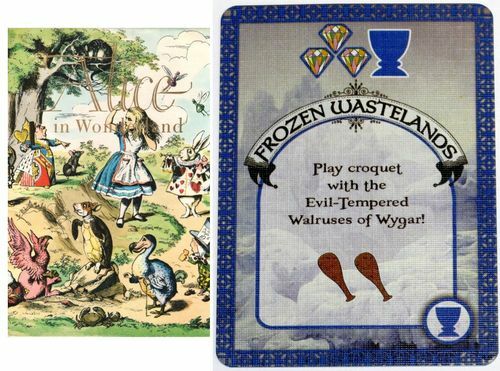 --"Play croquet with the Evil-Tempered Walruses of Wygar!" (requires two clubs) makes me think of Alice in Wonderland. Great one James! We had caught that one when playing, but I hadn't thought to add it to this list! "Who’s that stomping over my bridge?" roared the troll, resting his chin on his hands. 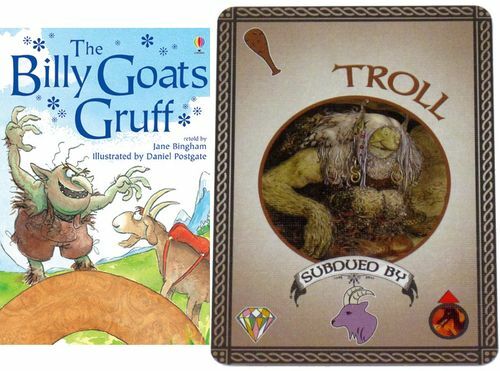 "Billy Goat Gruff," said the third goat in a deep voice. "I’m going up to the mountain to eat the lush spring grass." "Oh no you’re not," said the troll as he clambered up on to the bridge. "I’m going to eat you for breakfast!" "That’s what you think," said the biggest Billy Goat Gruff. Then he lowered his horns, galloped along the bridge and butted the ugly troll. Up, up, up went the troll into the air... then down, down, down into the rushing river below. He disappeared below the swirling waters, and was drowned. 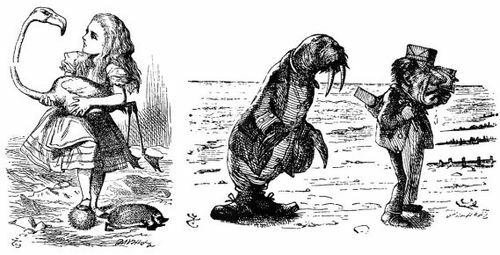 The Walrus appears in a narrative poem entitled "The Walrus and the Carpenter" in Lewis Carroll's sequel, Through the Looking Glass. It's been a while since I looked at some Greek mythology, and I wasn't entirely familiar with the details, so I had to do some research to remind myself of what this was all about! The story of the "Labors of Hercules" is that the great hero Hercules was ordered to perform a number of labours/tasks, as part of his penance after killing his sons in a state of insanity. His fifth assignment was to clean the Augean stables, which housed thousands of livestock and hadn't been cleaned in 30 years. No problem for our friend Hercules - he simply rerouted a couple of rivers to do the job for him, getting it done in a day just as he'd said. When Augeas learned that Eurystheus was behind all this, he would not pay Hercules his reward. The "Wardrobe of Changing" artifact has to be a Narnia reference. 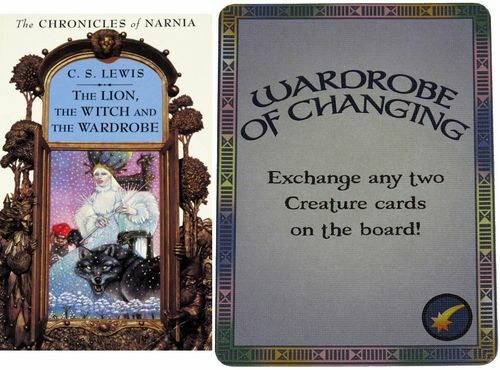 I'm sure everyone is familiar enough with Narnia to get the obvious connection! There's also a "Looking Glass" artifact. Any guesses as to the origin of that? Alice in Wonderland is one possibility, but is there perhaps a magic Looking Glass in another well known tale of the fantastic? It'll be a few days before I get this game (looking forward to it!) so I've not really seen any cards yet I'm waiting to see them in the game rather than find them online. A Woozle is a weasel-like creature imagined by the characters in the third and ninth chapters of Winnie-the-Pooh. No Woozles actually appear in A. A. Milne's original stories, but the book depicts them as living in cold, snowy places. They are first mentioned when Pooh and Piglet attempt to capture one, which they assume made the tracks in the snow going around a larch spinney. The more they follow them, the more sets of tracks they find, but Christopher Robin shows them that the tracks around the spinney are their own. 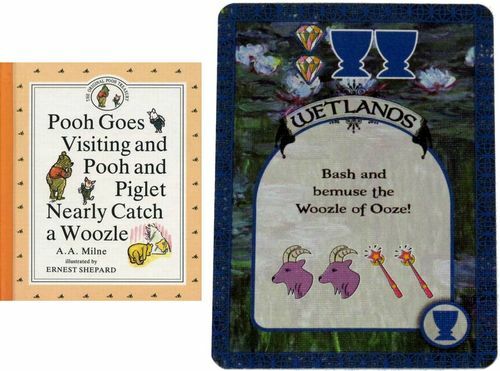 Woozles appear in the song "Heffalumps and Woozles" in Winnie the Pooh and the Blustery Day, which establishes their fondness for stealing honey and their association with Heffalumps. In The New Adventures of Winnie the Pooh, Woozles are real creatures. A Woozle named Stan and his sidekick Heff the Heffalump are recurring villains. They once recruited a giant Woozle named Wooster who turned against them when Pooh and his friends taught him the value of friendship. Woozles do not appear in the Disney adaptations nearly as often as Heffalumps do and, unlike Heffalumps, always attempt to act as villains, with Wooster being the only one to change his mind on this. Funny none of us caught this one earlier, but the very name of the game itself is a changed spelling of the magical world from The Neverending Story: Fantastica. 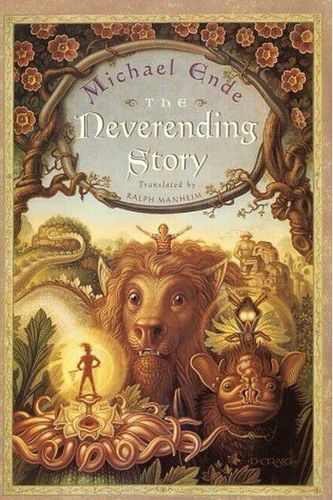 The Neverending Story (German: Die unendliche Geschichte) is a German fantasy novel by Michael Ende, first published in 1979. The standard English translation, by Ralph Manheim, was first published in 1983. The novel was later adapted into several films. The majority of the story takes place in the parallel world of Fantastica (Phantásien in the original German version; referred to as Fantasia in the films), a world being destroyed by the Nothing, a mysterious force. The first protagonist is a young warrior who is asked by the Steward of The Empress of Fantastica to set off and find a way to stop the Nothing; the other protagonist is a boy from the real world, a reader of a novel with the same title, for whom the story gradually becomes more and more realistic. 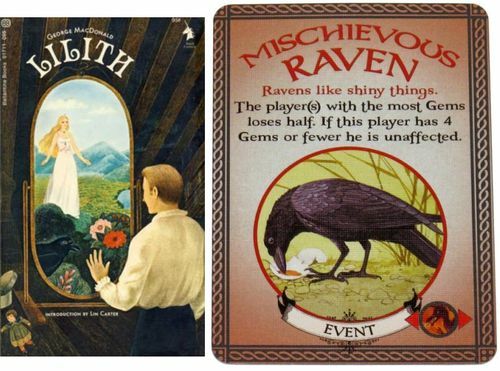 Lilith is one of several fantasy novels by George MacDonald, and was a partial inspiration for the "Mischievous Raven" event card. Mr. Vane, the protagonist of Lilith, owns a library that seems to be haunted by the former librarian, who looks much like a raven from the brief glimpses he catches of the wraith. After finally encountering the supposed ghost, the mysterious Mr. Raven, Vane learns that Raven had known his father; indeed, Vane's father had visited the strange parallel universe from which Raven comes and goes and now resides therein. Vane follows Raven into the world through a mirror (this symbolistic realm is described as "the region of the seven dimensions", a term taken from Jacob Boehme). Interesting thought with the Raven, but I've never read Lilith, so I can't say. Though in general, Ravens (like coyotes and foxes) have often been depicted as "tricksters" in various forms, ranging from fables, to Native American stories, to Poe's "The Raven", etc, so it makes sense, in that regard, to have a "Mischievous Raven." I had corresponded with Alf about this, and he pointed me to Lilith as a specific and partial inspiration for the Mischievous Raven. But the examples you mention are all quite credible too. As you say, the raven is used more often in literature as a trickster - great comments Jeremy! Keeps those suggestions coming, folks! I had corresponded with Alf about this, and he pointed me to Lilith as a specific and partial inspiration for the Mischievous Raven. As a result of your findings, I decided to add Lilith to my ever growing reading list, but I remembered from my English masters class on classic fantasy that I had read a book by George MacDonald, but hadn't enjoyed it at all. Curious to see what it was, I found it was Lilith. Funny... I only remember a white tiger or leopard, and allegories with people sleeping, etc, but no memory of Mr. Vane, a library, or Raven. Mainly because I did not like the content, the writing, or any of the allegories -- none of it clicked with me, but fell flat overall. So I guess I'll take it off my list, as I'm not a fan of MacDonald, though I'm very glad he inspired others like Lewis and Tolkien. Yes! I'm currently re-reading The Chronicles of Thomas Covenant by listening to the amazing audiobook read by Scott Brick. I also wrote a short essay on pain inspired by leprosy in Thomas Covenant, available here. I like your avatar image of the Forestal! Amazing books.